स्पार्ता (दोरिक युनानी: Σπάρτᾱ Spártā, एत्तिक युनानी: Σπάρτη Spártē) छगू दोरियन युनानी सैन्य राज्य ख। थ्व राज्य दक्ले न्हापां लाकोनियाय् अवस्थित दुगु खने दु। थ्व सिटी-स्टेट सैन्य तालिमय् दक्ले न्ह्य लागुलिं थ्व राज्य युनानी साम्राज्यय् दक्ले बल्लागु सेना दुगु खने दु। एथेनियन साम्राज्य व एखेमेनिद साम्राज्य नाप युद्धय् त्याये धुंका थ्व राज्यं थःयात प्राचीन युनानया प्राकृतिक संरक्षकया कथं कायेगु यात। Laconia or Lacedaemon (Λακεδαίμων) was the name of the wider city-state centered at the city of Sparta, though the name "Sparta" is now used for both. The Kings of Sparta were believed to be the direct descendants of Heracles. The city of Sparta lay at the southern end of the central Laconian plain, on the right bank of the Eurotas River. 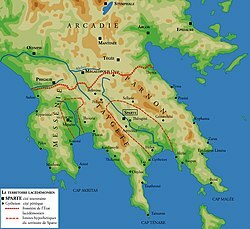 It was a strategic site, guarded on three sides by mountains and controlling the routes by which invading armies could penetrate Laconia and the southern Peloponnesus via the Langhda Pass over Mt Taygetus. At the same time, its distance from the sea—Sparta was 27 miles from its seaport, Gythium—made it difficult to blockade. ↑ The Macedonian Empire: the era of warfare under Philip II and Alexander the Great, 359-323 B.C. - James R.
↑ "The Spartan tradition in European thought", Elizabeth Rawson - p.
This page was last edited on २७ अक्टोबर २००७, at ०७:२८.